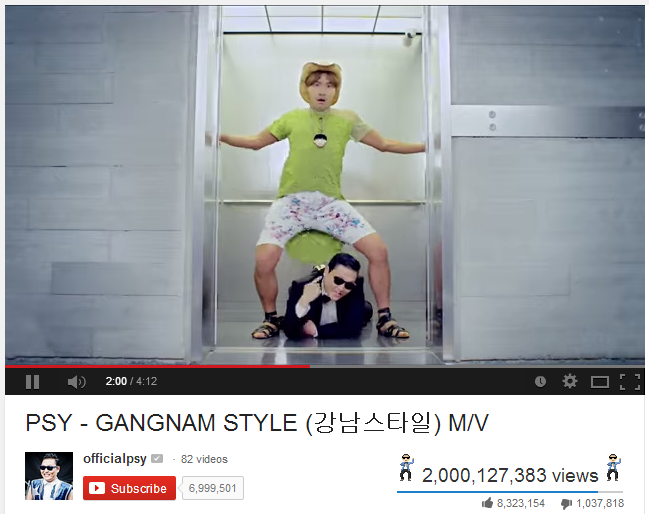 Youtube announced today, May 31, 2014 that Psy's 'Oppa Gangnam Style' music video has just become the first video to hit 2 billion views. The Korean superstar and known as the King of Youtube now celebrates the unprecedented milestone. 'Gangnam Style' surpassed the billion mark on December 21, 2012. 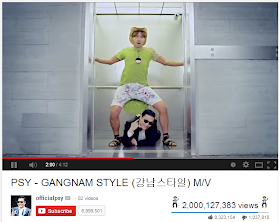 And a little more than 17 months, the video reached its goal to hit 2 billion views late on Friday (May 30). To mark the milestone on Youtube, special pieces of animation showing little dancing Psys around the view counter were added. Netizens on Youtube were also amazed on Psy's achievement as some gives quick facts. One comment from Luis Miguel Rivera says: "To watch Gangnam Style by yourself 2 Billion times, it would take about 5,833,333 days, or about 15,981.73 years." 'Gangnam Style' was uploaded on Youtube on July 15, 2012, and now hailed as most-viewed clip of all-time on the video website. No other video comes close to "Gangnam" on the streaming service's list of top videos. Justin Bieber's "Baby" is the only other billion-plus video at 1.04 billion views. Psy holds the record for most overall views and most views in a day with 38 million for his "Gangnam Style" followup "Gentleman." It was reported that Psy will make a comeback soon as he recently filmed a new music video with Snoop Dogg and fellow K-pop superstar G-Dragon.